The AUSA Book Program traveled to Kentucky in early April – not to visit the Louisville Slugger factory or the Patton Museum (which, sadly, remains closed for repairs) – but in search of new books. The setting was the annual meeting of the Society for Military History that brought together hundreds of researchers and historians. The halls were filled with people from the United States Military Academy, the Center for Military History, the National WWII Museum, and dozens of other universities and institutions. 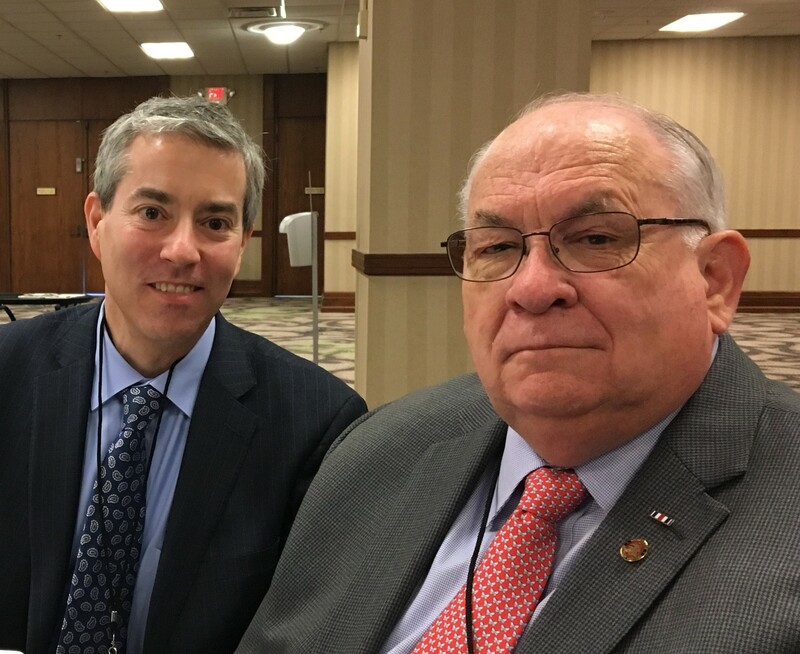 It was a good time to catch up with current AUSA authors such as Brian Laslie (Architect of Air Power) and James Willbanks (Generals of the Army) and to scope out potential new ones. James Willbanks, author of Generals of the Army, and AUSA Book Program Director Joseph Craig. Over two dozen publishers featured their books in the Exhibit Hall, including AUSA partners Naval Institute Press, Casemate, and University Press of Kentucky. Paul Merzlak, editorial director of Naval Institute Press, joined three representatives from university presses in a roundtable discussion of what publishers are looking for when they decide to acquire a book. He emphasized that authors need to say up front what their book is about and what makes it worth reading. At the same panel, Jay Dew from Texas A&M University Press noted that the majority of submissions he receives are memoirs, followed by stories of battles or campaigns, biographies, and “big picture” histories – but his interest in publishing them is in the reverse order. However, he and the others noted that telling a good story is the most important factor. The next Society for Military History meeting will take place May 9–12, 2019, in Columbus, Ohio. The following year, our friends at the Army Historical Foundation will host the meeting in Arlington, Va., on April 30–May 3.